Critical Capabilities for Case Management Software? Case Closed! In a February 2014 report, Critical Capabilities for Case Management, Gartner Group® defined the following 11 critical capabilities for investigative case management solutions. 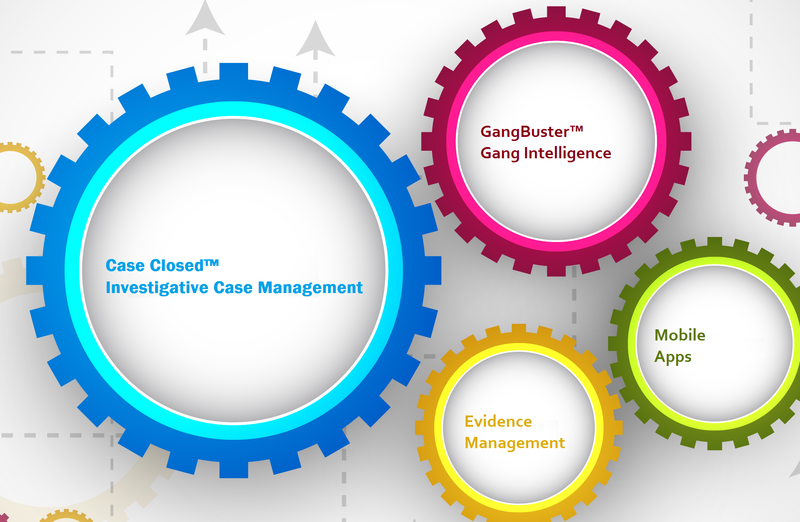 Crime Tech Solutions applies all of these critical capabilities to the powerful CASE CLOSED™ SOFTWARE for deployment at government and commercial investigative groups. Investigative case management solutions always require a broad range of data types, from highly structured data (such as an individual’s name, address or ID) to highly unstructured data (such as scanned images, blueprints, faxes, email communications, and audio or video files). 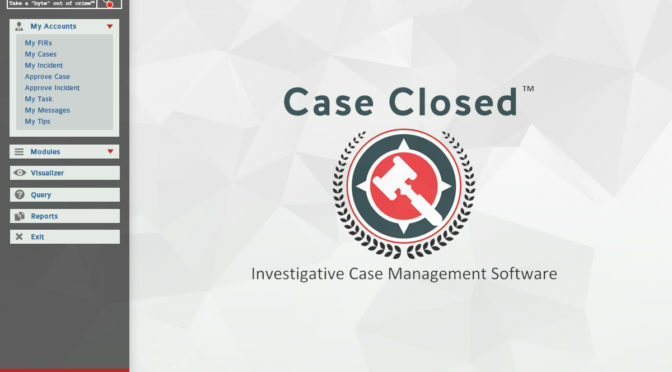 CASE CLOSED supports this requirement with unique and patented functionality that allows investigators to interact with this content, using capabilities such as view or read, comment, highlight, update or change, and append. Supports a broad range of collaboration services to facilitate individual and group interactions among all (internal and external) case participants. Collaboration among people (and even potentially with third party software) is incorporated into CASE CLOSED so that all interactions are recorded as part of the audit trail of how a case is handled. CASE CLOSED’s built-in support for e-mail communications, messaging, and alerting further supports collaboration efforts – across the aisle or across departments. Interoperates well with other external content and process services. Successful investigations and prosecutions often depend on external content and process services from repositories and applications. The attraction of CASE CLOSED’s open, standard specifications is that enterprises will know that integration with content repositories, web portals, and external software will require less custom code or specialized adapters. Provides vertical – and horizontal – specific data models, nomenclature, hierarchies and case life cycle management. Crime Tech Solutions has substantial experience in specific domains such as financial crimes and law enforcement investigations. We have transferred the lessons learned from consistent use cases and data definitions directly into CASE CLOSED. Because investigative case management solutions are difficult to design and architect, such out-of-the-box configuration patterns tend to accelerate the implementation time. Provides application adapters to industry and domain-specific environments. Crime Tech Solutions constantly endeavors to integrate with our customers’ critical systems of record. Crime Tech Solutions is well-acquainted with the specialized applications and data sources that dominate certain industries and domains, and thus CASE CLOSED offers accelerated integration with core systems of record. Provides comprehensive, highly configurable, role-based user experiences. Designed by former law enforcement officials, CASE CLOSED offers role-based user interfaces that tend to focus and simplify case handling – a critical step toward productivity gains. Crime Tech Solutions idealizes the interface between case workers, the content in cases and the managers who make decisions based on the work in progress. 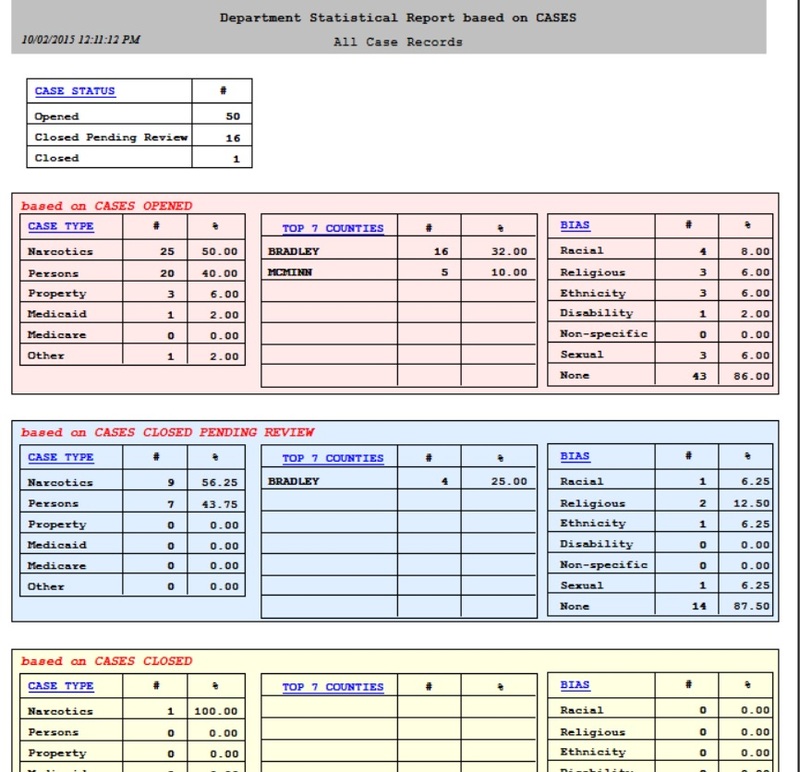 Provides business-role-friendly dashboards, metrics and reporting. Investigative groups want flexible and powerful case management solutions that allow them to manage and modify their own solutions, and to get meaningful information from them. As a result, CASE CLOSED provides access to case execution history, as well as appropriate dashboards, models, visualizations, reports and other tools to monitor, analyze and report on case handling. Supports a broad range of case orchestration, from highly structured to highly unstructured flows. CASE CLOSED provides case orchestration for a spectrum of applications, ranging from very structured (predictable sequences of activities, usually represented in a flow model) to very unstructured (where progression is not easily predictable, and ad hoc activities may be invoked during the execution of the case). CASE CLOSED is also designed to easily adapt to the investigation group’s evolving business processes. Has been proven in deployments with 100,000 cases or more annually which is especially important for areas such as claims management and fraud investigations. While some investigative case management deployments do not require the volume capabilities of 100,000 cases or more, others do. Crime Tech Solutions’ software has been designed – and has been deployed – with very large scale case handling as a critical capability. Provides intelligent and versatile on-ramps and off-ramps for incorporating content (such as document capture, mobile phone cameras, fax servers and e-forms). It doesn’t matter how the information exists, whether on paper, in a digital document, as an image, in an email, in a voice mail or on the internet: CASE CLOSED is designed to allow capture and control with as much upfront intelligence as possible. Coupled with the ability to deliver various inbound content objects to a case folder is the ability for CASE CLOSED to generate outbound content (such as e-Brief), and the ability to export case data. Leverages models for easy adaptability of the solution. CASE CLOSED leverages appropriate data models to enable business and technical roles to easily adjust their solutions as needed. This includes easy adaptation of the design as well as easy adaptation of executable behavior. Importantly, CASE CLOSED provides the ability for dynamic and ad hoc adjustments to in-flight work. This means that the execution path of in-flight cases can be immediately adjusted in an unanticipated (ad hoc) way. According to Gartner, investigative cases are the most complex in terms of process (workflow) and content (data). These cases are data-heavy. Often, data is captured as part of the case and relationships between data elements emerge over time. Patterns in the data are discovered, evaluated and acted on. Sequencing of actions on the case is very ad hoc, and event/milestone-driven. Figure 1 shows examples of case-based processes that fall under each of these four use-case categories, and shows the structured vs. unstructured nature of the processes and data associated with each. CASE CLOSED SOFTWARE from Crime Tech Solutions is designed specifically for the Investigative (data-heavy) market and resides in the upper right quadrant of diagram. In the midst of preparing for a presentation last week, I entered the term “financial crimes” into my internet search engine. I’ve probably done this same search a hundred times, but seemingly never took notice of the staggering number of results. Over two million of them! 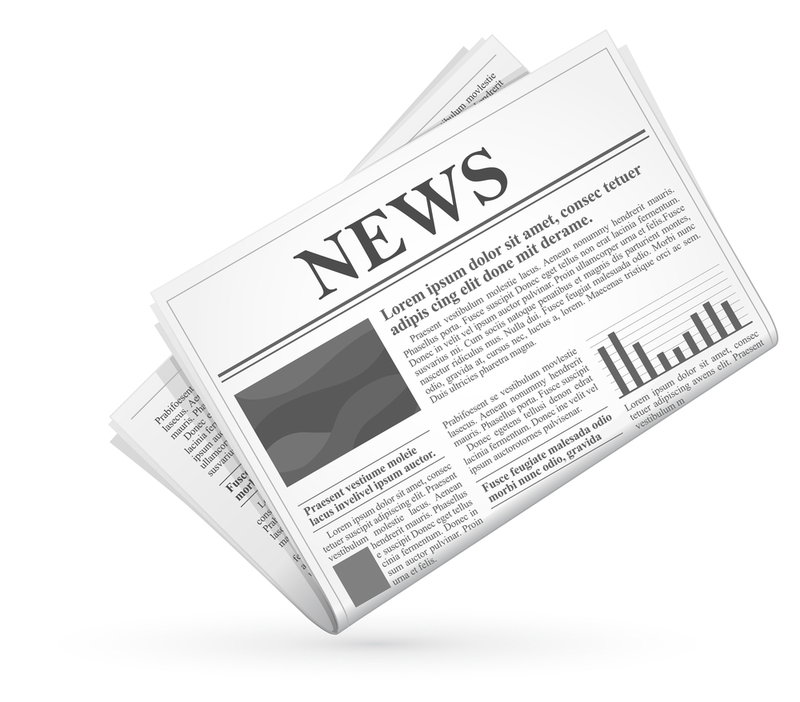 Among those results are a stunning number of definitions, news reports, and general articles. But with so many links to seemingly unconnected terms such as check fraud, credit card fraud, medical fraud, insider trading, bank fraud, health care fraud, tax evasion, bribery, identity theft, counterfeiting, and money laundering – it must appear to the uninitiated that an understanding of ‘financial crimes’ requires an Einstein-like intelligence pedigree. 2) The illegal process of concealing the source of those gains. Everything else – all that other noise – simply falls underneath that definition, and only a cohesive combination of human intelligence and technology can take a bite out of those crimes. Of course, most companies that are targets of these crimes invest heavily in different forms of technology for enterprise fraud management and anti-money laundering systems. There are dozens of vendors in this market with varying levels of functionality and service offerings. The problem with too many of those offerings, however, is that they do not account for organizational truths such as functional (and data) silos, data quality issues, changing criminal tactics, human limitations, and big data. Customer Onboarding – Knowing the customer is the first step an organization can take to prevent financial crimes. A holistic view of an entity – customers, partners, employees – provides a very clear view of what is already known about the entity including their past interactions and relationships with other entities. Flexible Rules-Based Alert Detection – A robust rules-based alert detection process must provide out-of-box functionality for the types of crimes outlined at the beginning of this article. At the same time, it should be flexible enough for an organization to modify or create rules as criminal activities evolve. Predictive Analytics – Expected by analysts to become a 5.25B industry by 2018, predictive analytics ensures that big data is scrutinized and correlated with present and past historical trends. Predictive analytics utilizes a variety of statistics and modeling techniques and also uses machine information, data mining, and Business Intelligence (BI) tools to make predictions about the future behaviors including risk and fraud. Social Network Analysis – Also known as Fraud Network Analysis, this emerging technology helps organizations detect and prevent fraud by going beyond rules and predictive analytics to analyze all related activities and relationships within a network. Knowing about shared telephone numbers, addresses or employment histories allows companies to effectively ‘cluster’ groups of suspected financial crime perpetrators. The key here, however, is context. Many technologies can build these networks and clusters for review, but precious few can provide the key “what does this mean” element that business users require. Investigation Management and Adjudication – Incorporating key elements of enterprise case management, collaboration, link visualization, information dissemination and knowledge discovery, this layer of functionality is designed to uncover insights which aid in investigating complex incidents. The result ought to be actionable visualization of critical entities, and documented results for potential litigation and regulatory compliance. Anti-Money Laundering (AML) and Regulatory Compliance – With record fines being assessed to financial institutions globally, AML compliance is very clearly a major requirement within a financial crimes management solution. The oversight requirements grow almost daily, but at a minimum include out of box functionality for suspicious activity monitoring, regulatory reporting, watch list filtering, customer due diligence, Currency Transaction Report (CTR) processing, and the Foreign Account Tax Compliance Act (FATCA) compliance. Now, there are clearly many more dynamics than can be summarized here but hopefully the point is made. The only way that organizations can continue to drive fraud and money laundering out is via a happy marriage between skilled financial crimes professionals and the flexible/adaptable technology that empowers them. Posted by Douglas G. Wood. Click on ABOUT for more information.